Liverpool have a history of possessing some of the worst away kits in the Premier League over the years, from the division’s inaugural season right up to today. Don’t get me wrong, they have had some good ones, but for whatever reason the Merseyside outfit has probably had the worst collection of away jerseys over the past 27 years, despite changing kit manufacturers on four different occasions. Adidas’ template design for 1992 simply did not work with this colour scheme. All of the details are extremely large: the white stripes, the crest and the collar. Liverpool’s third kit for two seasons, this jersey looks like the printer malfunctioned midway through the printing process. Nothing about it works, including the collar and sleeves, and there’s far too much going on. Dark green and white quarters? Not for me, Jeff. 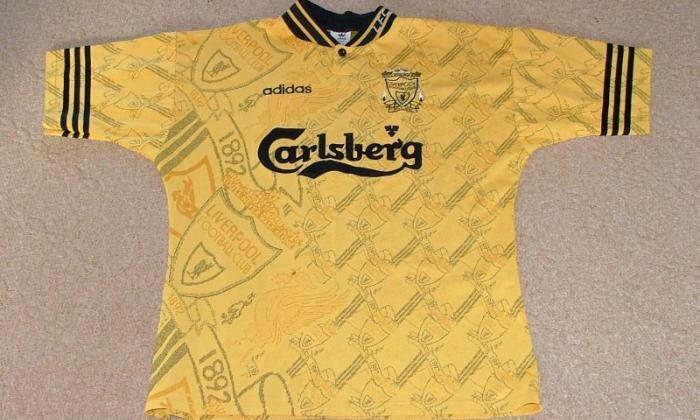 The yellow and bright red combination is a staple of Liverpool away kits going all the way back to the fifties, but Reebok’s attempts to revive the combo in 1997 just didn’t work. Umbro’s take on it worked really well in the eighties, when it just seemed to fit the decade for whatever reason. On this occasion it just looked garish, an apt descriptor for many of the jerseys listed here. Between 1999 and 2002, Reebok incorporated blue into Liverpool’s away kits for the first time ever, a throwback to the club’s colours upon their founding. The first rendition was a really odd green and blue effort, and even though they used a really nice shade of green, this baggy top is ghoulish. During their ‘blue phase’, Reebok’s white and blue getup in 2001 was more akin to a Bolton Wanderers jersey. The season before that they released this amber and navy blue kit that stood out a mile away, and not in a good way. This number is unlikely to be forgotten in the depths of football history, unfortunately, as it was worn by the Reds when they dramatically defeated Arsenal with two late Michael Owen goals in the FA Cup final. Is this it? Could it be? The worst Liverpool kit of all time? With a god awful colour combination of purple, orange and white, and those bewildering tribal designs on the sleeves, there is a very compelling to say so. 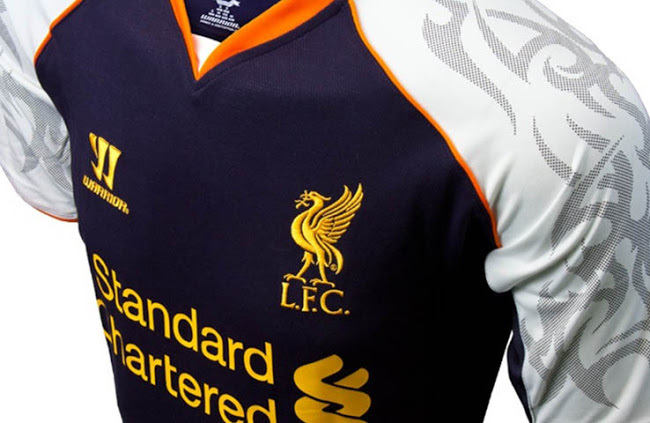 Warrior did not exactly cover themselves in glory during their short three-year stint as Liverpool’s kit manufacturers. It’s certainly a bold design, but it’s also overly complex and hard to look at for too long. New Balance have done some pretty good designs since becoming the club’s official kit supplier in 2015, but I cannot abide by anything neon yellow or green. This particular one was called ‘toxic thunder’, but luminous colours like these do not belong on a football pitch.